Deckbuilding is a pretty popular buzzword in the tabletop community these days, and it almost seems as if every month a new slew of hot deckbuilding games are on the verge of release. You may have heard of Dominion, the game that started it all. So what the heck does “deckbuilding” mean, anyways? Deckbuilding is actually pretty much what it sounds like. To sum up, you start with a small deck, which over the course of the game you build into a larger, more complex, and more efficient deck. The genre is one of the newest on the gaming scene. Well, in a sense. Here’s a little bit of background: “deckbuilding” itself is originally a facet of CCGs, or Collectible Card Games, for which we’ll have a separate Guide in the future. Collectible Card Games – the most popular by far being Magic: the Gathering – are games in which you purchase small packs of randomized cards and then create your own personal deck using those cards. The goal is to build a deck that efficiently provides abilities that work well together and the resources to power those abilities. All of the deck customization comes before the game actually starts, though, and success in the game requires having a well-built deck and being familiar with it so you can appropriately plan your strategy. Deckbuilding as a boardgame mechanism came straight out of this idea. Deckbuilding games are all about building an efficient deck to reach the goals of the endgame by adding cards that effectively work together and removing cards that are worthless. The main difference here is that deckbuilding games are self-contained and the deckbuilding is front and center to the game itself, whereas CCGs require the constant purchase of randomized packs to stay competitive, and the deckbuilding is a precursor to the game. Deckbuilding games available today tend to offer very similar mechanisms with slight twists and variations, and of course new themes. 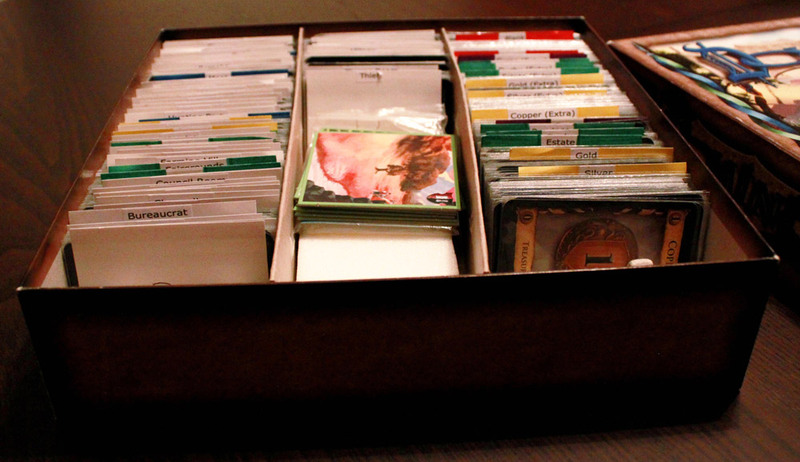 A common staple of the DB genre is that each player has their own deck to build. This is perhaps the first requirement of a deckbuilding game. Another common element is that a player’s starting deck is filled with cheap and sometimes useless cards. 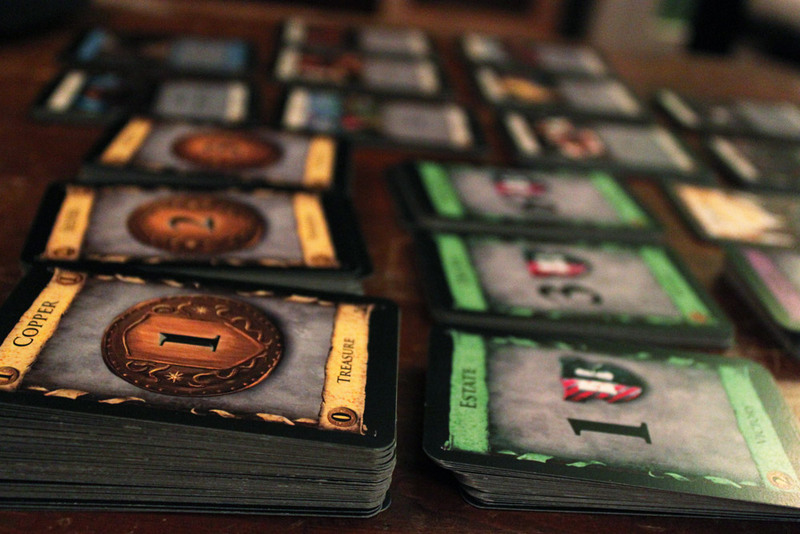 The prime example I will use is Dominion, which was the game that launched “Deckbuilding” as a type of board game. In Dominion, your starting deck consists of 7 “coppers” which have a buying power of 1 treasure each and 3 “Estates” which are worth 1 point each but otherwise do absolutely nothing during the game. A core feature of the gameplay is that players will draw cards from their deck, use them, and then recycle those same cards back into their own deck in addition to adding new cards. The number of cards drawn varies, but the most common number is 5. Usually, cards that players may add to their deck are found in a central area, accessible by any player during their turn. In some cases, this central area contains a static set of cards, so players can always purchase from the same set of cards available to their competitors. This is how Dominion did it, and games like Thunderstone and Nightfall followed suit. 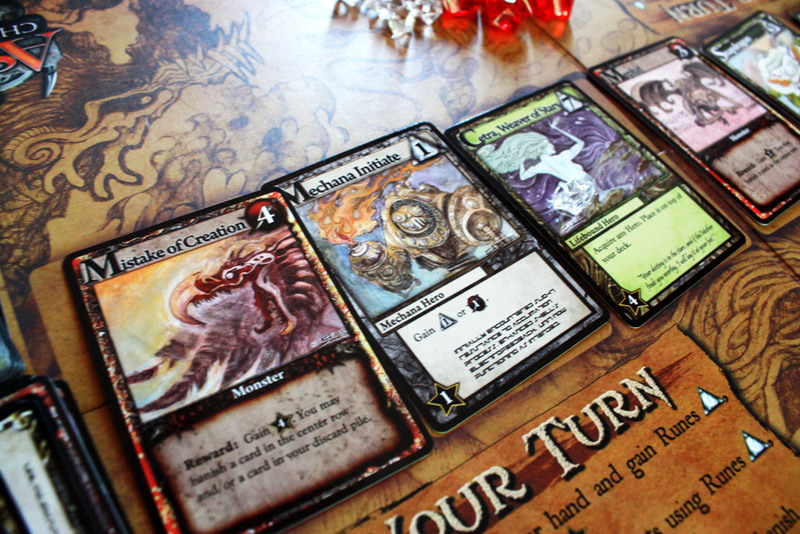 Other games, like Ascension: Chronicle of the Godslayer, feature a rotating supply of cards in the center, meaning players must choose from the cards available at the time, and the setup will likely change by the time their turn comes back around. Swab the poop deck! Deckbuilding games are very expansion-friendly, which leads to boxes looking something like this (Dominion). Depending on the game, cards can be gained in various ways. In Dominion, cards are gained by playing enough Treasure from one’s hand and then purchasing that card from the central supply. This method is the most common way of obtaining cards, and is often the core focus of the game; building an efficient way to accrue lots of treasure in a single hand. Thunderstone, Nightfall, Ascension, and a slew of other games such as Star Trek: the Deckbuilding game have used this method as a way of obtaining cards. 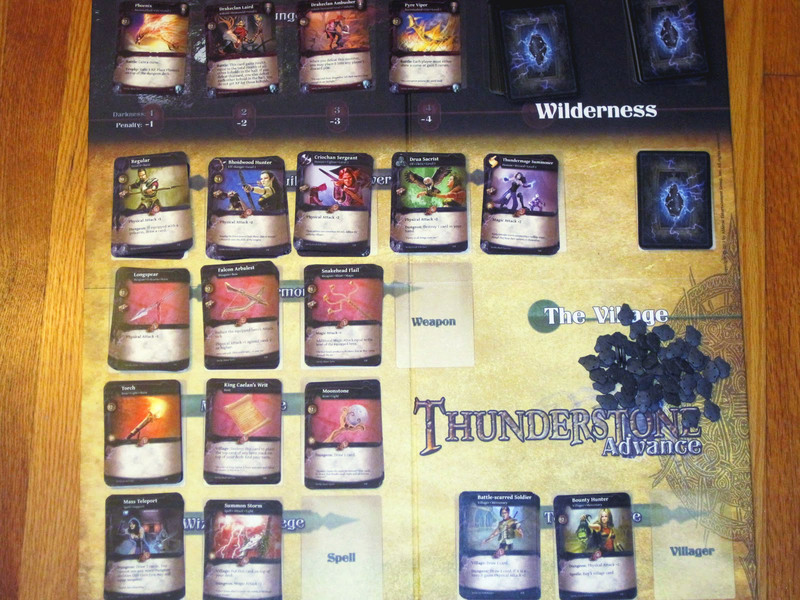 Thunderstone adds another way to gain cards, though not necessarily favorable cards; by using heroes and weapons to “attack” and defeat monsters, those same monster cards are added to the player deck, serving as both a way to score points and a method for preventing runaway leaders, as most monster cards aren’t all that useful during the game. Other games have started to explore even more alternative ways of building a deck; in Salmon Run, cards are gained by moving over certain spaces on a board, or by moving too much in one turn, while in Miskatonic University for Girls, other players add cards to your deck. Deckbuilding games generally feature mechanisms of a wide variety to improve your deck over the course of the game. Actions you perform, other than simply gaining cards by purchasing them, include drawing additional cards into your hand, removing cards from your deck entirely, or even looking at your upcoming cards and reordering them or even discarding some of them to increase the efficiency of future draws. One of the biggest “complaints” about deckbuilding is the lack of player interaction. As the focus is on efficiently building one’s own deck, direct player interaction is often sparse. However many deckbuilding games do include ways to interact with opponents by forcing them to gain bad cards, or discard cards from their hand, or even steal cards from them. Interaction also comes in more subtle ways; since cards to add to your deck are generally available in limited supply, so you have to pay attention to other players and make sure to grab cards important to your strategy before other players take them all. Since the Deckbuilding mechanism is so new, games are only just beginning to unlock the potential uses. While many games fall into a structure that is very similar to Dominion, with only minor twists, others have started to push the boundaries. Eminent Domain is an example where cards in your deck are not “earned” in any way, but simply chosen as part of your turn, and the actual functions of cards are focused elsewhere – towards colonizing or conquering planets, producing and trading goods, and researching technology, most of which are not really tied to the deck. Salmon Run uses deckbuilding to moderate speed to enhance the core of the game, which is a race. It does this by forcing players to add “fatigue,” which is a useless card and thus decreasing the efficiency of the deck, when a player puts all their effort into moving. Police Precinct, while not a deckbuilding game, uses a deckbuilding element to simulate the search for evidence. Players investigating a murder will draw cards from evidence decks, searching for the useful evidence cards in the midst of useless “Nothing Yet” cards. However, each time a player searches, they remove a “Nothing” card, increasing the efficiency of that deck and the likelihood of encountering evidence on the next foray into that particular avenue. To me, the most interesting thing about deckbuilding games is the nature of controlled luck. In many card-based games, a lot of your success can depend on which cards you draw, which are determined by a random shuffle. In a deckbuilding game, you still have the randomness inherent in shuffling, but you choose which cards to add to your deck. This gives you a lot of control over what happens to you over the course of the game, and it makes your choices matter (at least, in a good implementation of deckbuilding it does). The shuffling keeps a limited luck element that prevents the game from being “solvable,” and adds the excitement and tension of never knowing what you’ll draw next. The nature of this also allows the game to add difficulty by forcing inefficient cards into a player deck. This also allows the game (and sometimes other players) to affect the game’s pacing, and prevent runaway leaders without the “mario kart” effect – the player who builds the most efficient deck will likely win, but does not win simply by getting the best card first. And they don’t get so devastatingly set back by the bad cards that a poor player will suddenly overtake them. There are a few variations on the deckbuilding mechanism – you’ll hear the term “Dice-building,” and another variation might be called “Token pool building.” In both of these variations, dice or tokens are gained just like cards in a deckbuilding game, but these tokens are put into a small opaque baggie for shuffling, and drawn randomly from that bag. 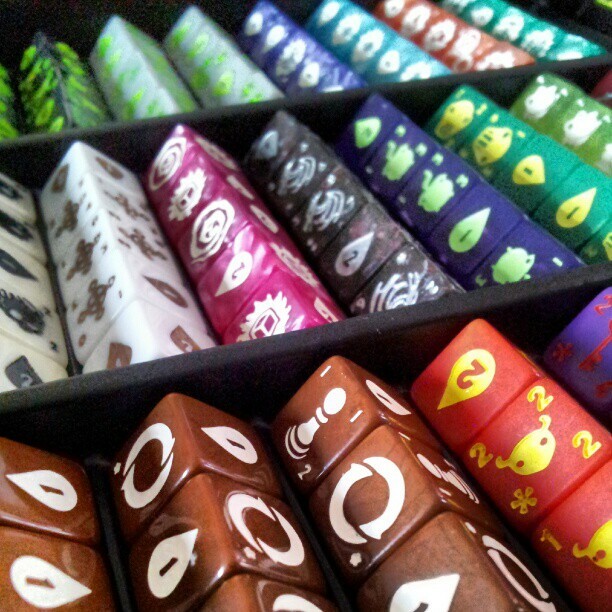 Of course, dice building adds the additional luck element of rolling dice. Players will start with a basic set of dice, and over the course of the game receive better dice with a decreased chance of failure or more powerful options. 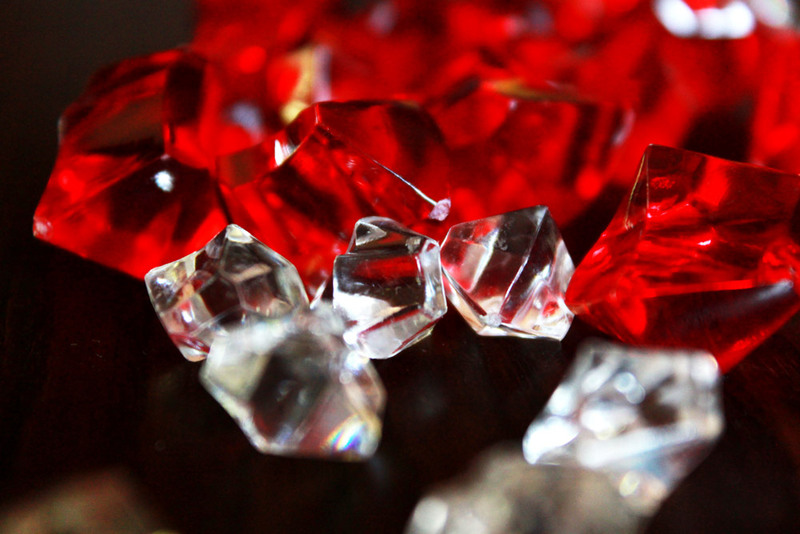 Quarriors was the first game to implement dice-building. Puzzle Strike is very similiar to Dominion, except opting for Token Pool building. Token Pool building has the advantage that no shuffling is needed, and putting tokens into a bag to shuffle them is much quicker than shuffling a deck of cards. Deck building does have a strategic advantage over both dice and token pool building in that, once shuffled, the order of cards coming next is set. This allows the addition of actions that can rearrange or interact with the next few cards in the deck. I believe we will see a lot of innovation with the deckbuilding mechanism in the future as designers come up with new ways to implement the feature that stray farther and farther away from the Dominion template. In the meantime, there are no shortage of deckbuilding games to try out. Hopefully this Guide has given you a sense of what to expect when you see “Deckbuilding Game” printed on a box at your local gaming store. IF you have any questions, feel free to comment or tweet at me @futurewolfie. If you’re interested in reading more about deckbuilding, check out my Dominion strategy guide, which starts out with general deckbuilding tips. We have a number of other guides available as well, and look for more every week! Any questions? Think I left out an important element or a great deckbuilding game from the timeline? Leave a comment! If you want a strong player interaction, I recommend Terra Evolution. It has direct hits against opponents continents and evolutionary species. You can do it with catastrophe cards to steal their species or just hurt their population in order to weaken the opponent. Warning though. It is a very aggressive game and not all players like this kind of a strong interaction. I think it fits the theme quite well. What, no mention of the only truly co-operative deckbuilding game out there? Not to mention it is also the best of the lot — can’t recommend it highly enough: Shadowrift. I’ll add it into the timeline. It’s definitely not a comprehensive list up there. I like the deck building mechanic but find the subset selection setup / packup process in deck builders kinda tedious although I acknowledge it adds to replayability due to mixed card sets. I’ve a strong feeling that the success of new deckbuilders like DC Comics and LotR are due to the minimal setup (like ascension) although they are often considered lightweight because of that. I agree there is starting to be some interesting evolution of deckbuilding as a mechanic eg within a wider set of mechanics. And yes the lack if interaction frustrates me so much that I’ve making my own highly interactive ’empire builder’ game that has deck building as one of several mechanics within a broader multiplayer combative framework. Forgot to say that was another good mechanics overview! Pingback: رومیز – وقتی از Deck-building حرف می‌زنیم، از چه حرف می‌زنیم؟!